This past week I got an email out of the blue, asking “Hey Nick, Sharon is going to be in New York and would like to meet with you if your able”………and my response was, NO DOUBT, I’m always available for Sharon. Who is Sharon? Let me give you her Bio first: Co-Author of the Classic NY Times Best Seller: Rich Dad Poor Dad, was appointed to the first President’s Advisory Council on Financial Literacy. The Council served both President Bush and President Obama, Sharon also has time to be a, philanthropist, educator, international speaker and licensed CPA. Yes, this would be the Amazing Sharon Lechter. 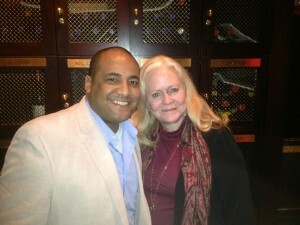 It’s not only great to meet with Sharon as she is just awesome, but every time I speak to her I LEARN. I started learning from Sharon when I was just a young twenty year old finding his entrepreneurial spirit. And now years later as I gain traction in the business world and begin to lay out my own foot prints of success, I still take the time to make sure I meet with business pioneers and mentors like Sharon. The things I always learn from Sharon are business practices, ethics but more importantly I learn strategy as I plug away with questions like a kid in a candy store prodding her for info on her latest projects so I can not only apply it to my business interests but to also bring back the in-valuable information to our youths at YoungBiz USA!! At YoungBiz USA we never stop learning so that we can continue to grow and be a better business every day. It’s important for our Teachers and Parents to know the people we learn from because it’s that very same knowledge we’re passing on to your youths! As we learn and evolve, so do our youths, teachers and parents. With great alliances and mentors like Sharon Lechter, our youths will always be fed great information to teach them to become self-reliant, creative and most importantly understanding it’s COOL to march to the beat of their OWN drum!